The Formula E World Championship electric car racing series just lined up another piece of the puzzle ahead of launching the series: television broadcast of the races. FOX Sports has signed a multi-year international multi-media deal with the FIA Formula E World Championship, the electric race car series set to launch in 2014. The network will broadcast Formula E races across the FOX family of networks spanning 88 territories on six continents. 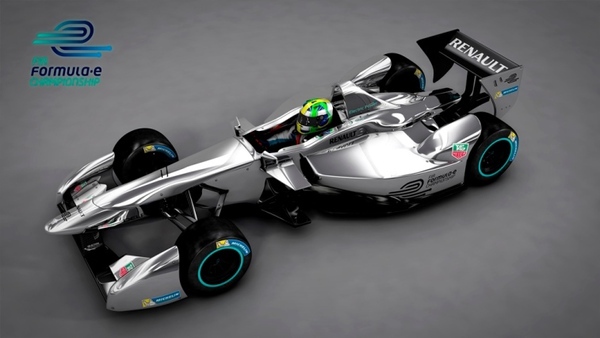 The Formula E World Championship is a new racing series that will feature electrically powered open wheel cars similar in design to Formula 1 cars. The series is slated to launch in September 2014, and will consist of 10 races in host cities around the world. It's designed to promote interest and investment in electric vehicles and sustainable motoring. There will be 10 teams each with two drivers, competing in one hour races using Formula cars capable of reaching speeds of more than 220kph with zero emissions. "This series makes racing very relevant well into the future," said Carlos Martinez, President Latin America for FOX International Channels, who helped broker the deal. "With a global approach to acquiring knowledge and fast-tracking technology through the world of international racing competition, the FIA Formula E Championship is much more than just another weekend at the track...it makes racing an integral part of solving one of the world's most daunting challenges and we are thrilled to be a part of that process." FOX will have exclusive broadcast rights for the Formula E series in the U.S. and a variety of exclusive and non-exclusive rights in more than 80 territories including Canada, Latin America/Caribbean, Netherlands, Italy, Hong Kong, Malaysia, Indonesia, Singapore, Taiwan, South Korea, Australia, key Asian territories and other areas of Asia, India and Africa. "We are very proud to announce this major agreement between FOX and the FIA Formula E Championship and to be partnering a truly global organization that fully believes in the future of racing," said Alejandro Agag, CEO of Championship promoter Formula E Holdings. "This global broadcasting deal will bring our Championship to nearly 90 countries and a potential 180 million households worldwide, giving our partners, our teams, and our team's partners a platform to visualize the association to the values of this competition. We are particularly happy to join FOX at the time when FOX Sports 1 is being launched. America is a key market for electric cars and to show our races live in the US will be central to promoting this type of mobility." In July the series announced they'd completed the 2014-15 calendar with deals for 10 host cities, and made arrangements for a consortium of companies to build the race cars. Leading IndyCar outfit, Andretti Autosport, also recently become the first US team to join Formula E. Other announced teams are Drayson Racing and China Racing, and there are three other unannounced teams.